Good Afternoon. I finished ***. 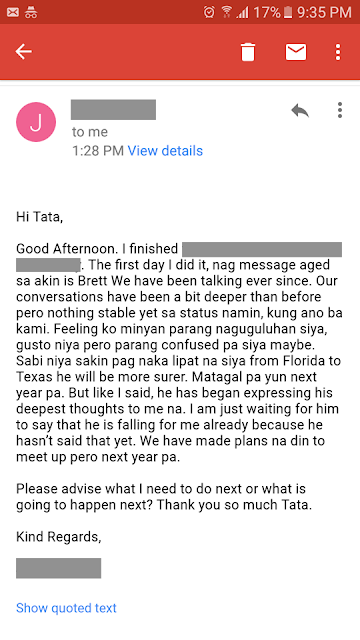 The first day I did it, nag-message agad sa akin is Brett, we have been talking ever since. Our conversations have been a bit deeper than before pero nothing stable yet sa status namin, kung ano ba kami. Feeling ko minsan parang naguguluhan siya, gusto niya pero parang confused pa siya maybe. Sabi niya sa'kin pag nakalipat na siya from Florida to Texas he will be surer. Matagal pa yun next year pa. But like I said, he has began expressing his deepest thoughts to me na. I am just waiting for him to say that he is falling for me already because he hasn’t said that yet. We have made plans na din to meet up pero next year pa.